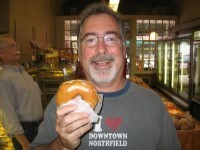 …Alaskan Doughnuts, that is…much bigger ones than pictured at left. Though, let me assure you, this freshly baked treat from Quality Bakery was a more than adequately satisfying snack for me this morning. 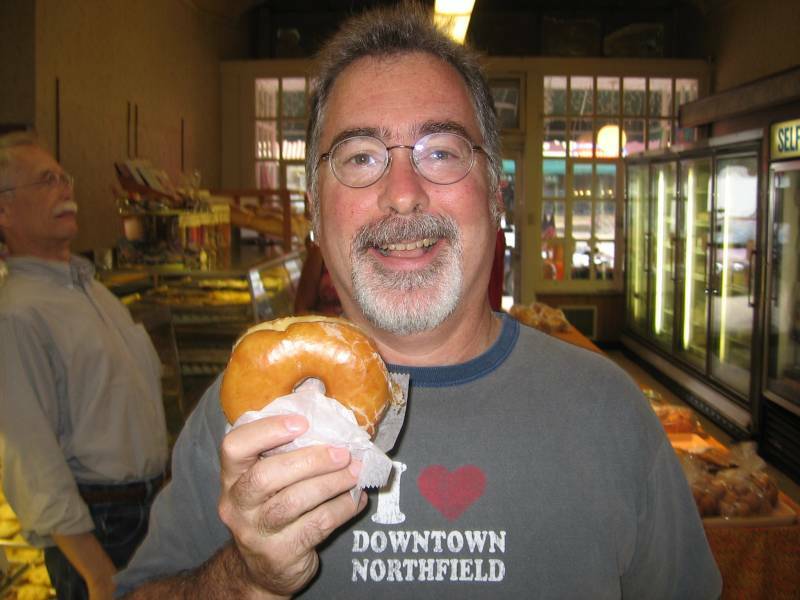 For the past few years, ever since that infamous photo taken by Griff Wigley in 2003, the local paparazzi hound me as I do my rounds of downtown, hoping to catch me with a doughnut in my hand…or better yet…mouth. CRAZY DAZE…that annual summer celebration of shopping locally. This year, the Retail Committee of the Chamber of Commerce has once again put together a schedule of great events. In addition to the CITY-WIDE BARGAINS, TASTY FOOD SPECIALS, and SIDEWALK SALES GALORE, there’s Half Price Tours by the Northfield Historical Society, a Just Food Co-op Employee Costume Contest, a “Nuts & Bolts” Challenge by Ace Hardware, Pedal Cart Races by Equine Outfitters, The Chicken Cannon by Hot Geeks LLC, Make 4H Trail Mix, Crazy Co-op Carnival at Just Food, Free Food, Free Ring Flyers and $1,000 medallion search contest by Ziman Orthodontics, Steamroller Printing by ArtOrg, a Skateboard demonstration, break-dancing performance, dunk tank and drawings by Union of Youth, a Game by Kids on Division, a Newspaper Throwing Contest by the Northfield News, a Hula Hoop Contest by Rare Pair, Design & Paint T-shirts by Rocky Top, Waiters’ Race between local restaurants, Dance performance by Dance-N- Fitness, “Classic Cars” displayed by Sundowner Car Club, a Dance performance by Northfield Dance Academy, and 50’s/60’s music by KRDS Radio. The fun runs from 7 am to 8 pm. So come on down(town) and join in, Thursday, July 24th, Crazy Daze.